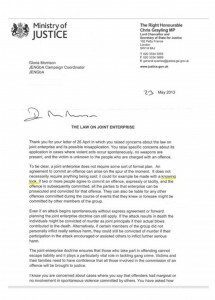 We reproduce here a press statement from 17 December 2014 by Joint Enterprise: Not Guilty by Association (JENGbA) on the publication of the Justice Select Committee’s recent report on joint enterprise. JENGbA whole-heartedly welcomes the report released today by the Justice Select Committee which calls for an urgent reform of the law of joint enterprise. We commend this committee which, at a time when politics and politicians are increasingly viewed as self-seeking and out of touch, have taken such a bold stand against an unjust law. The Committee’s call for this serious issue to be addressed as a matter of urgency is a major breakthrough for our campaign and the hundreds of prisoners and their families that we support. Today’s report tells the damning truth about our justice system. Chris Grayling needs to re-think the Ministry of Justice’s policy towards an unjust law which allows someone to be given a life sentence for ‘a knowing look’ (see picture). This can be enough to condemn even a child to a life sentence for a murder committed by someone else. 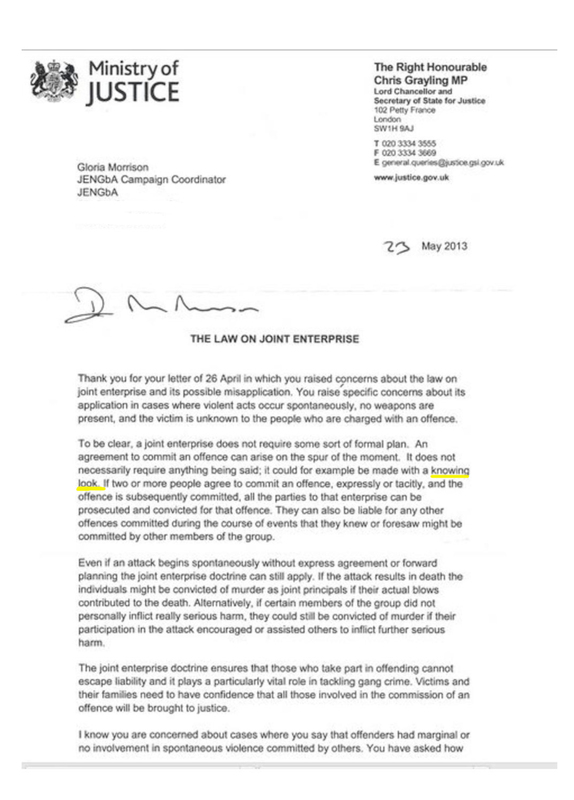 JENGbA Patron Jimmy McGovern’s film Common, mentioned in the Committee’s report, brought joint enterprise to a mass audience in July of this year and gave the public a greater understanding of this legal doctrine. Although the drama was fiction, we have contact details of families up and down the country whose voices and stories of crippling injustice have never been heard, including mothers of children as young as 13 years of age serving a life sentence for someone else’s crime. Joint Enterprise has been a hidden injustice for far too long. We also welcome the Committee’s call for the Crown Prosecution Service to provide statistics on the use of joint enterprise. The lack of this fundamental information has served to slow down the work of the Inquiry. That this has finally been acknowledged is another step in the right direction for all those seeking justice. The Committee has also highlighted concerns that the doctrine is being used disproportionately against young people from Black and mixed-race backgrounds, an issue that JENGbA has consistently highlighted in its evidence to the justice committee. Gloria Morrison, JENGbA Campaign Co-ordinator, says ‘Innocent people have been tarnished as murderers by the mass media. Those of us who have spoken publicly about joint enterprise over the last few years have often been met with scepticism. We have always called this a lazy law, which gives prosecutors a short cut to conviction, but only at the risk of ruining another innocent life. Thanks to the work of the Justice Select Committee, our concerns will have to be taken seriously. It is time for the government to act’. Joint Enterprise is immoral and we are thankful we no longer have a death penalty. If we did, the hundreds of people we represent would have followed in the footsteps of 19 year old Derek Bentley, the last teenager to be hanged in this country for a Joint Enterprise murder for which he was later found to have been innocent.